The NASC will be exhibiting at the forthcoming Safety & Health Expo, June 20-22 at London’s prestigious ExCeL venue on Stand R90 – alongside the Access Industry Forum (AIF). 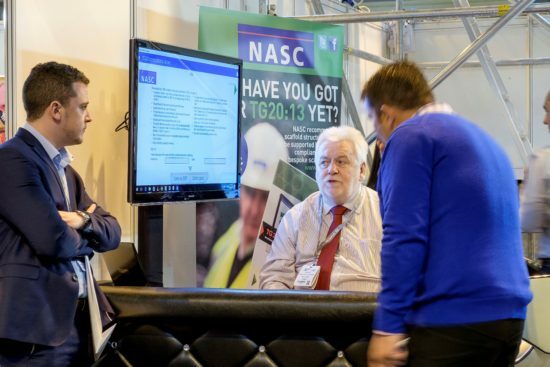 This will be the fourth consecutive year NASC has exhibited at the UK’s largest health and safety event. The three day conference and exhibition attracts c14,000 health and safety professionals alongside the media, leading industry associations, manufacturers, distributors, consultants and multiple sector experts under the same roof – covering topics such as working at height, CPD, behavioural safety, risk management, PPE and occupational health products, services and more. From the AIF stand, NASC Technical Officer, Ken Johnson will be promoting the recently published NASC 2017 Safety Report, 50% discounted TG20:13 ‘Good Practice Guide for Tube & Fitting Scaffolding,’ SG4:15 ‘Preventing Falls in Scaffolding Operations’ and the 80+ other NASC safety and technical guidance notes to delegates at this leading health and safety event. Expo visitors will also be able to access keynote presentations at the linked IOSH conference by Dame Kelly Holmes, Professor Brian Cox OBE and Simon Weston CBE, and will be treated to 100+ industry speakers, in six theatres over the three days (adding up to 60+ hours of CPD accredited presentations) and more than 300 exhibitors will be taking part, including NASC and AIF on Stand R90. NASC MD, Robin James said: “NASC is pleased to be working with AIF at this flagship health and safety event – reaching out to the construction and health and safety sectors who attend en masse. Together, we are hoping to spread the safe work at height message and promote the good work of the NASC, who set the industry standard in scaffolding, access provision and working safely at height. The Safety & Health Expo is run exclusively with the support of IOSH, RoSPA and is presented by SHP online media, and is one of the largest events of its kind in Europe. In order to attend this free event, loaded with trade stands and packed with seminars, interested parties should pre-register for a pass here. And for details on the NASC’s TG20:13, SG4:15 and the plethora of recently published, industry-accepted Technical Guidance (TG) and Safety Guidance (SG) and the NASC – the national trade body for access and scaffolding in the UK – including how to become an NASC member, please visit www.nasc.org.uk or email: enquiries@nasc.org.uk. Details of the Access Industry Forum (AIF) and its 11 working at height industry members can be found here.